Valentine's Day Minibook- Just print two sided and fold in half. Text also makes a great cold read, small group, independent, partner reading or whole group reading activity. There is a fun word search and a quick assessment on the back. 1- Teacher Directed: Make copies until you have enough to give each student one-half of a heart. For example, there are four hearts on the page, so that is enough for eight students. Teacher can fill in hearts, then cut and distribute half to each student. Students walk around the class to find their partner match. Then, students can share their matches with the class. Collect the cards, shuffle them and pass the out to play again. 2- Student Directed: Students can fill in their own facts with math facts, vocabulary words, or any other skill (synonyms, antonyms) they are working on. They can use all or some of the hearts. After they complete their hearts, they can cut out and give to a neighbor to solve. 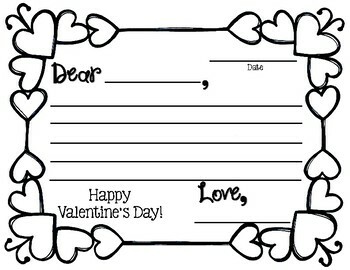 Valentines Day Letter Template- Ask the students to write a letter to someone they love telling them why they love them so much. 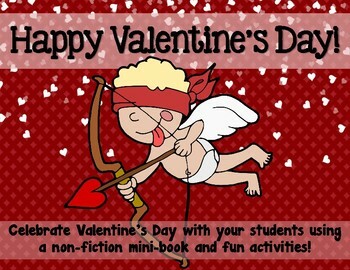 Valentine’s Day Homework Pass- Instead of giving out candy, give your students a “sweet” homework pass. Heart Templates- Students can the half heart template or the full heart template to make a heart shape card. First, print on red or pink paper, then fold in half on line. Finally, cut dotted line. Open to reveal a full heart. or they can practice cutting on the dotted lines. Heart Puzzle- Have students create their own puzzle by writing matching facts for any subject (see examples). 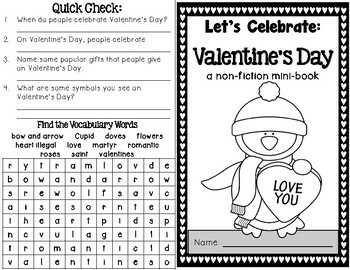 Word Scramble- Student rearrange the letters in the word “Valentine’s Day” to create new words. Valentine’s Day Book Marks- Print on cardstock. Have students color and cut out their own bookmarks. 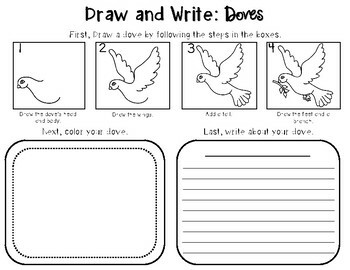 Draw and Write: Doves- Students follow the steps to draw and write about doves. They can write facts or story about doves.